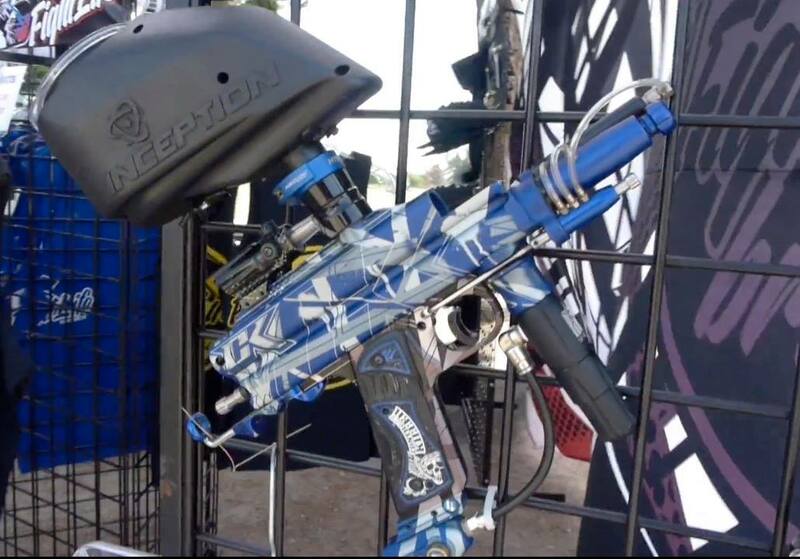 Here is a quick video from the West Coast PSP showing Contract Killer Paintball’s booth and a CK laser engraved System X Autococker on display with with an Inception Designs’ Pico loader on it. Inception Design’s Pico Loader is not an entirely new package, it’s a set of replacement shells for halo style loaders. It’s not being sold currently but is being offered by Inception designs as free to download 3d printer plans so players can make their own. Simon Stevens, formerly of Kee and now behind Inception Designs, chose this route because of the questionable market for a hopper this size. He hopes to eventually offers the shells but in the meantime has allowed others to print their own. I could never get used to a halo on my blazer or Autococker and in those cases I still run my revy. With the Pico shell conversion kit you take the forcefeed internals from your halo/empire or whatever else and stick them in this. I have 2 empire halo (can never remember the name for them) that I keep around that I will be converting to these if the opportunity arises. I know I’ll likely never use them in their current size but with this shell, either I’ll use them or I can offer them as loaners for friends playing semi. For the capacity I shoot this won’t be the loader for my direct feed pumps but for my autococker, blazer and mag I would definitely choose this over a Halo (or whatever else forcefeed is on the market and it would give some competition to my Revys. Chris’ Contract Killer engraved System X Autococker with Inception Designs Pico Loader. I don’t think the Inception Designs Pico is really an attempt at a pocket hopper (or a vl-90) but rather a smaller force feed. Maybe the first step towards downsizing and getting an idea on demand. And the dimensions are really determined by the bottom funnel and internals in a halo so for this platform not much can be done about that. Right now it’s not for sale complete and the plans are available free so you just have to find someone to print it and hopefully have a halo style loader sitting around. If not you can likely find one for 30 dollars.